Louis Van Gaal hailed the atmosphere in the dressing room as “fantastic” after Manchester United secured an unexpected 1-0 win in the Manchester derby. 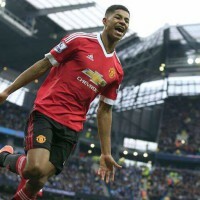 Marcus Rashford scored the only goal of the game, netting after just 16 minutes, and United looked in control for an hour but were forced to cling on their slender lead in the final 30 minutes. “I’ve seen the dressing room after the match and it was fantastic, the happiness,” said Van Gaal. The United manager added that his players felt they could bridge the gap with top four and see off a challenge from West Ham and City to clinch a Champions League spot for next season. “We are one point behind, equal with West Ham, with more home matches than away matches, so we have a big possibility [of a top-four finish],” he said. “The players feel that, and I can only give a compliment to all of them. “I said in advance we must win and we’ve done it, so I’m very happy, otherwise the gap would be too big if they had won or we had drawn.